Kaiser & Kohler, Cincinnati, after 1859. Franz Kaiser and William Kohler were among the many German-born instrument makers active in the United States in the second half of the 19th century. Established in 1857 by Franz Kaiser in Cincinnati, Ohio, the firm was joined by William Kohler in 1859. The company mostly supplied unmarked instruments to dealers, such as Kaiser's cousin, Rudolph Wurlitzer, who then signed them with their own names. This over-the-shoulder cornet is one of the very few extant brasses that is actually marked with the firm's name, Kaiser & Kohler. Engraved on garland: Kaiser & Kohler Makers Cin. O. Body: German-silver body: leadpipe with telescopic tuning slide, valve cluster, and bellpipe (integral bell and bell bow). Overlapping tab seam extending over the entire length of the bellpipe (sloping tabs 3-4 mm wide and 3-4 mm apart). Undecorated garland; Saxon rim with iron-wire insert. Ferrules with one engraved line adjacent to each edge. Bell to the left of the leadpipe. Valve with V-shaped cork buffers stopping the reciprocal driver pivot; left valve in "on" position, right valve in "off" position. 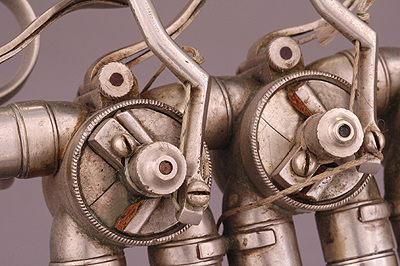 Valves: Three top-action, string-operated rotary valves. Leaf-spring return mechanism; reciprocal driver pivot stopped by V-shaped cork buffers. Internal slide tubing. Windway: first, second, third valve. Accessories: silver cornet mouthpiece stamped R. STEWART (Robb Stewart, Arcadia, California). Sounding length (including tuning slide): 937 mm; internal diameter, leadpipe: 12.3 mm; internal diameter, telescopic tuning slide: 10.7 mm; bore diameter (inner valve slides): 11.4 mm; bell diameter: 116 mm. Lit. : Sabine K. Klaus, "Kaiser & Kohler—German-born Brass Musical Instrument Makers in Cincinnati, Ohio," Alta Musica, Vol. 26, ed. by Raoul F. Camus and Bernhard Habla (Tutzing: Hans Schneider, 2008), pp. 215-249.